Municipal workers carry out debris of flattened kiosks built without formal planning permission on the ground near a subway station in Moscow, Aug. 29, 2016. More than 90 buildings described as ‘unauthorized’ were taken down in Moscow in the early hours of Aug. 29, according to the press service of the State Inspectorate for Control over Moscow Real Estate. Demolition work began at midnight throughout the city, including the downtown area. "The dismantling of illegally built facilities was carried out as planned," the inspectorate said in the statement. 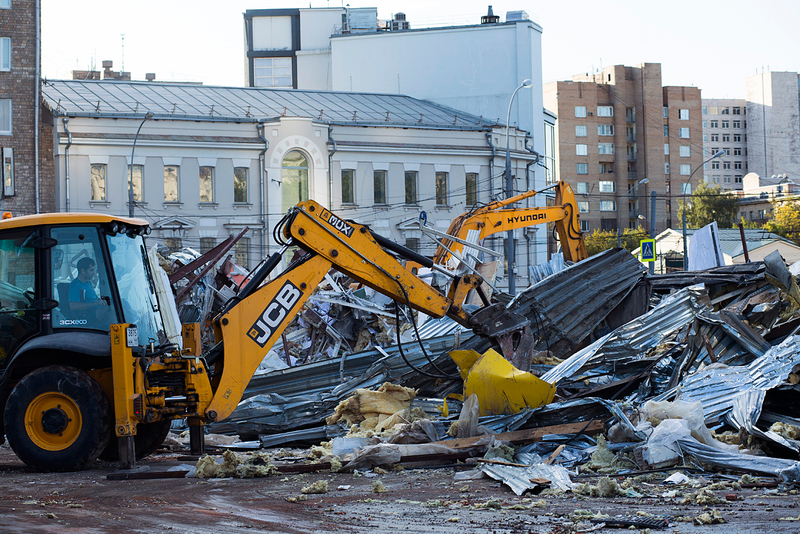 The first part of the mass demolition of buildings allegedly constructed without permits – samostroi in Russian – took place in February 2016, when 103 trade facilities were dismantled, most of them close to subway stations. The second list of facilities subject to be demolished was published in a Moscow government resolution of June 28, 2016 and comprised 107 facilities. Nearly two thirds of the owners of samostroi from the second demolition list agreed to have their facilities dismantled on their own. For that, they will receive compensation from the city worth up to 55,500 rubles ($850) per square meter.